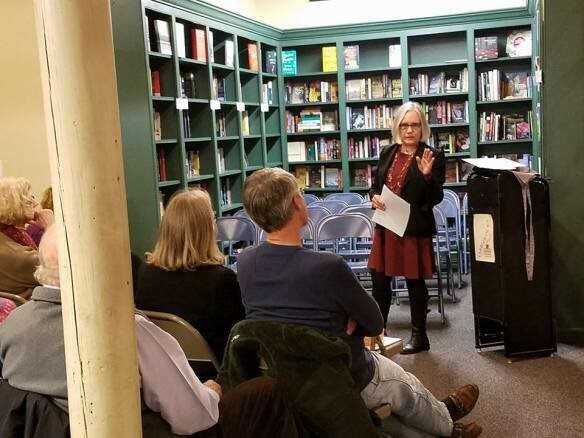 The Lauren Rousseau Mysteries feature Quaker linguistics professor Lauren Rousseau, small-town intrigues in the coastal Massachusetts town of Ashford, and conflicts at the college where she teaches. Edith Maxwell writes this series as Tace Baker. Summer promises to be anything but easy for Quaker linguistics professor Lauren Rousseau in Bluffing is Murder. During a run near the sea bluffs, Lauren discovers a corpse and sets out to discover the real story behind a mismanaged land trust, the dead man’s volatile sister—and a possible link to her own father’s mysterious death more than a decade ago. The book was a finalist for the 2015 Silver Falchion Award for Best Romantic Suspense Novel. In Book One, Speaking of Murder, the murder of a talented student at a small New England college thrusts linguistics professor Lauren Rousseau into the search for the killer. Lauren is a determined Quaker with an ear for accents. Her investigation exposes small-town intrigues, academic blackmail, and a clandestine drug cartel that now has its sights set on her. Speaking of Murder was first runner-up in the Linda Howard Award for Excellence contest, 2012. Read reviews of the Lauren Rousseau Mysteries.